As more women begin to speak up about their past experiences of being sexually harassed in the entertainment industry, the same cannot be said in the common workplace. There are no new substantial steps being taken to assist women who might be sexually harassed. According to a study done by the American Psychological Association, 29% of respondents said that they are more likely to leave my place of employment if it does not take steps to address sexual harassment. Giving attention to the issue has shown to be helpful in changing the attitude of workers towards sexual harassment in a positive direction. After the increased media attention on sexual harassment, 51% now agree that they are more likely to report sexual harassment if they witness it happening to others at work. While 50% said they are now more likely to report sexual harassment if they experience it themselves. On another note, only 8% of staff cited their bosses implementing a more stringent sexual harassment policy, while 32% of working Americans said that their employer has taken new measures to prevent and address sexual harassment in the workplace. It goes to show that further emphasis on tackling the issue can slowly resolve the the problems women face in the workplace. 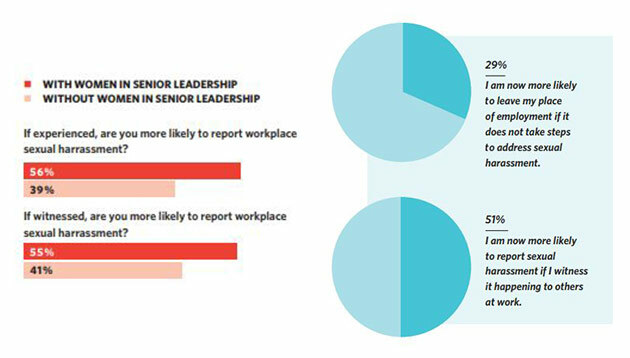 Psychologists recommend a comprehensive approach that incorporates fair policies that are clearly communicated, ongoing training, leadership support of civil and respectful culture, and the hiring and promotion of women into senior leadership roles. The survey also found links between increased efforts to prevent and address workplace sexual harassment and better employee and organisational outcomes more broadly. In workplaces where new steps were taken, 90% were in good psychological health and with 89% motivated to do their best work. 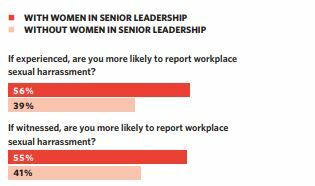 Additionally, women in senior leadership has also proven to show positive changes in workers with 56% more likely to report workplace sexual harassment if experienced and 55% more likely if witnessed.